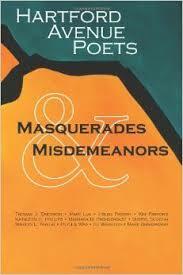 Masquerades and Misdemeanors by Hartford Avenue Poets. Pebblebrook Press, 2013. This poetry anthology features poems by the eleven members of the Hartford Avenue Poets, a group formed in 1999 and named after its meeting place on Milwaukee’s venerable East Side – a building on Hartford Avenue. The members of the Hartford Avenue Poets are: Thomas J. Erickson, Mary Lux, Helen Padway, Kim Parsons, Kathleen H. Phillips, Barbara B. Prendergast, Sheryl Slocum, Marilyn L. Taylor, Phyllis Wax, Ed Werstein, and Mark Zimmerman. The anthology’s poems are as diverse and varied as the poets themselves, all of whom live in (or near) the Milwaukee metropolitan area. As former Poet Laureate of Wisconsin Marilyn L. Taylor states in the introductory notes: “[I]t looks like Walt Whitman was right: we Americans are celebrating ourselves and singing ourselves with a degree of enthusiasm and relevance unmatched in recent literary history. And if the art of poetry is thriving from coast to coast, nowhere is it more vibrantly alive than right here in Wisconsin – the domain that we, the Hartford Avenue Poets, call home.” With over 100 poems from cover to cover, the reader is offered a virtual poetic smorgasbord of topics, themes, forms and meanings to choose from. The poems are replete with observations about the natural world, relationships, travels, the passage of time, regrets and outrages, personas and personalities, all through which their speakers present novel interpretations of their respective worlds. It is next to impossible to provide a complete review of such an interesting and thought-provoking anthology, nor do I want to play favorites by highlighting one or two poems (over other equally excellent poems) in the short space of this review. However, there are a few additional things which make this anthology noteworthy overall. All of the poems are very accessible, directly belying the stereotype that “good” poems, in order to be good, must be impossible to comprehend by a general, poetry-loving readership. If anything, even more skill and care in diction, phrasing, rhythm, and form must be employed when a poet is not relying on obfuscation to create a so-called poetic atmosphere in a poem. In addition, humor is found throughout the anthology. Even before one opens the book, the deliberately tongue-in-cheek review notes on the back cover tell the reader that the Hartford Avenue Poets, while caring deeply about poetry, do not take themselves too seriously. For example, the following back cover review note is attributed (tongue in cheek) to the fictional Emma Bovary: “I laughed. I cried. I laughed some more. Then I fell asleep.” Of course, the humorous tone of some of the poems does not undercut the serious tone of other poems in the anthology. It is simply gratifying to report that Masquerades and Misdemeanors shines when it shows off by flexing its multi-dimensional poetic muscles all at once: poems which display humor, gravitas, pathos, irony, longing, loss, grief, euphoria, nostalgia, disconnection and contentment – to name a few – all employed with the aim of clearly communicating with (and not talking down to) the reader. Mary Riley grew up in Milwaukee, Wisconsin. In addition to writing poetry book reviews, she has written articles in the areas of indigenous people’s rights, traditional medicine, and cultural anthropology. An avid poetry fan, Mary lives with her husband in Chicago, Illinois. Thanks for the awesome review, Mary!